Dominique Estival received a PhD in Linguistics from the University of Pennsylvania in 1986. Her research experience in Natural Language Processing has been at the frontier between industry and academia, with positions at ISSCO (Switzerland), The University of Melbourne, the Defence Science and Technology Organisation and private language technology companies in the US and Australia. In 2010, she joined the University of Western Sydney to manage AusTalk, the largest Australian audio-visual speech data collection. 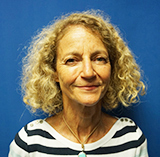 Her research interests have included the computational modelling of language change, machine translation, grammar formalisms for linguistic engineering, spoken dialogue systems and aviation communication.